The most affordable among shoes equipped with a carbon outsole, the LS-100 II offers a precise BoaÂ® micro-adjustment system and a super rigid frame for maximum performance. The absence of pressure points both underneath and on top of the foot make it an extremely comfortable and stiff shoe at a highly competitive price. The most affordable among shoes equipped with a carbon outsole, the LS-100 2 offers a precise Boa micro-adjustment system and a super rigid frame for maximum performance. The high-performance, racer fit reduces stack height to pedal while the HRS-100 with anti-slip membrane reduces power loss. The synthetic leather upper features Power Zone toe protection to provide comfort and durability. The insole and outsole are extremely ventilated, letting you ride in all weather conditions. 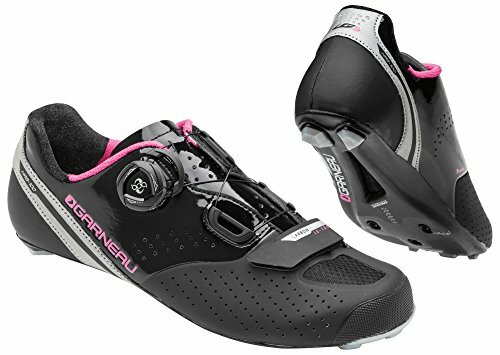 The Carbon LS-100 2 shoes weigh 205 g. The steel cleats fit all major road pedals. The reflective heel and front strap provide visibility in low light. If you have any questions about this product by Louis Garneau, contact us by completing and submitting the form below. If you are looking for a specif part number, please include it with your message.